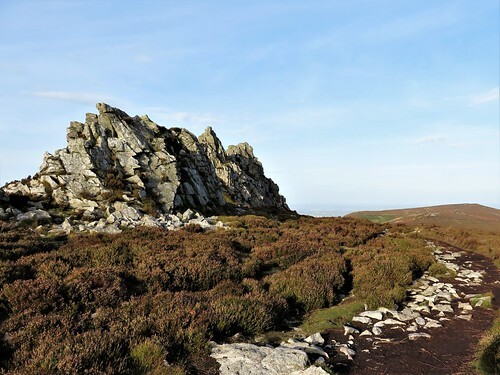 Geologically, the Stiperstones are easy enough to explain – outcrops of quartzite some 500 million years old, spread along a mile or so of heathery Shropshire ridge on a westerly spur of the Long Mynd. It’s their contrary aspect – jagged upthrusts of naked rock in the midst of smoothly rolling countryside – that has cloaked them in all manner of strange and demonic myths. And certainly, walking towards Cranberry Rock at the southern end of the line, it was disconcerting to find the harsh outline of the tor suddenly appearing between one minute and the next as though the ground had disgorged it all in a moment. It was a beautiful autumn afternoon. 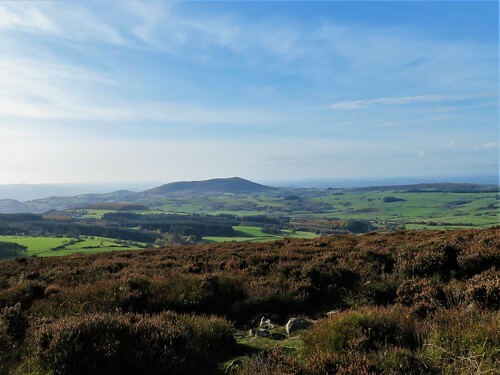 The Long Mynd was a glowing green bar of dimpled slopes in the east, the Welsh borderlands a sunlit haze of woods and hills to the west. Cranberries spattered the heather with scarlet. A pair of ravens flew high overhead, one giving out deep croaks, the other emitting a strange, musical warble. The path among the Stones, rocky and full of angular quartzite lumps, required careful watching. 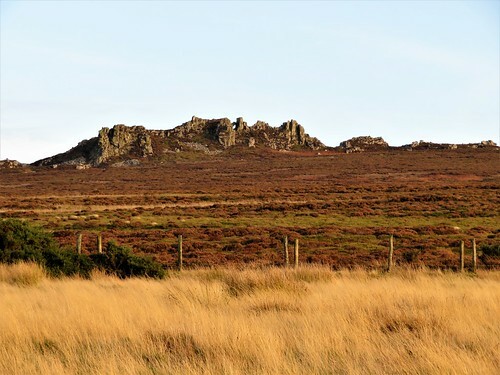 We followed it through the heather past Cranberry Rock and Manstone Rock to the Devil’s Chair – more like a giant and horrendously uncomfortable chaise longue of unforgiving stone. Wild Edric the Saxon, Lady Godiva and all the witches and warlords of Shropshire have the Devil’s Chair as their trysting spot. Here Slashrags the Tailor got the better of the Evil One, once he’d spotted his cloven hooves. And here the Devil reclines in stormy weather watching between the lightning bolts for the ruination of Old England. On that day, it’s said, the Stiperstones will sink back whence they sprang – into the bowels of Hell. 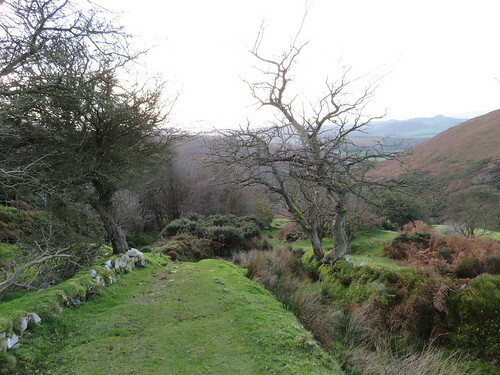 We descended a steep grassy path among old lead mine workings to the village of Stiperstones a thousand feet below. Down there, with the Stones shut away from sight by steep hillsides, it was hard to bring their otherworldly atmosphere to mind. But as we headed home along a track that skirted the ridge, we saw their ragged profiles lit by the setting sun and a spectral half-moon that sailed up out of the ridge. 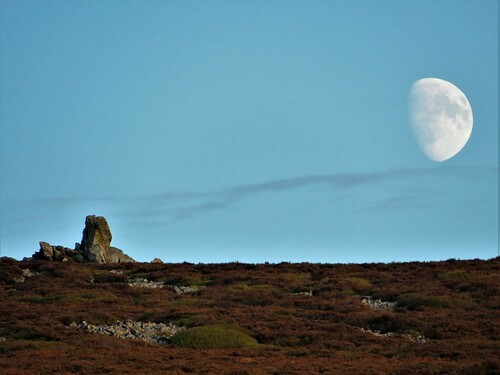 The Stiperstones stood sentinel, a ghostly guard above our homeward path. Road: From A488 between Bishop’s Castle and Shrewsbury, follow ‘Shelve’, then ‘Stiperstones’. 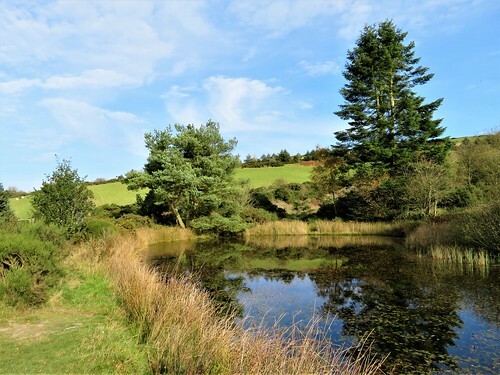 Walk (5 miles, strenuous, OS Explorer 216): Follow Shropshire Way/SW signs to right of pond; follow path, up steps, through kissing gate (arrow). Ahead along gorsy bank to kissing gate; left to cross road (362976). Follow SW ‘main route’ for 1 mile along ridge past Cranberry Rock (365981), Manstone Rock (367986) to Devil’s Chair (369992). In another 600m, SW turns right (371996); keep ahead here. 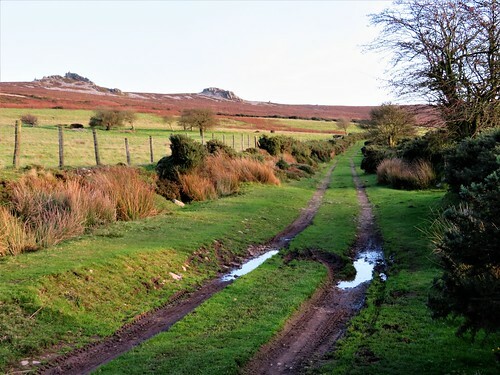 In 350m, at crossing and cairn by Shepherd’s Rock (373999, yellow arrow/YA, ‘Cross Britain Walk’) left down grassy path to road in Stiperstones village (363004). Left past Stiperstones Inn; in 400m, hairpin left (361002, fingerpost); cross stile; right, steeply up fence for 300m. 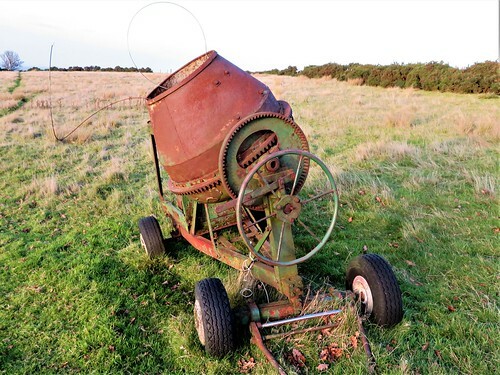 Left at post (359999, arrow); cross stile, pass NNR notice; steeply up through trees to cross stile at top (361996). Half left across field; right (361994) on stony lane for 1 mile to road (359980) and car park.